South Korea’s Samsung Electronics ranks second in terms of the number of patent applications filed worldwide, a recent report by the World Intellectual Property Organization showed. 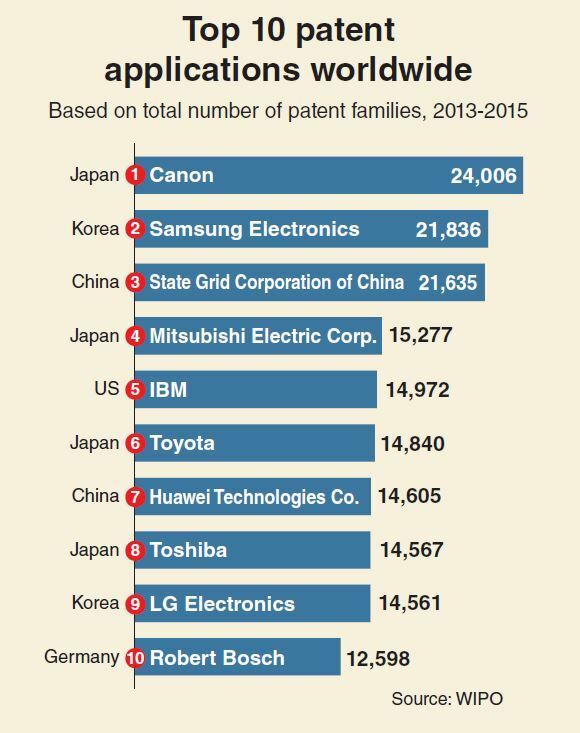 According to the World Intellectual Property Indicators 2018, Japan’s Canon created 24,006 patent families between 2013 and 2015, followed by Samsung Electronics (21,836) and the State Grid Corporation of China. For Samsung, the largest share of its patent families -- patents taken out in multiple countries to protect the same invention -- relate to computer technology (26.1 percent), followed by digital communication (15.9 percent) and semiconductors (11.9 percent). Moreover, eight of the top 10 companies with the most patent families are located in Asia, the WIPO report highlighted. IBM of the US, ranked fifth, and Robert Bosch of Germany, ranked 10th, are the only two non-Asian applicants in the top 10.